Every Friday we’ll be featuring a different GrowRVA vendor, in their own words, to help build a stronger connection between the artisans at the market and the rest of RVA. The first in our series is Atomic Bakery, now starting their second year at SOTJ. 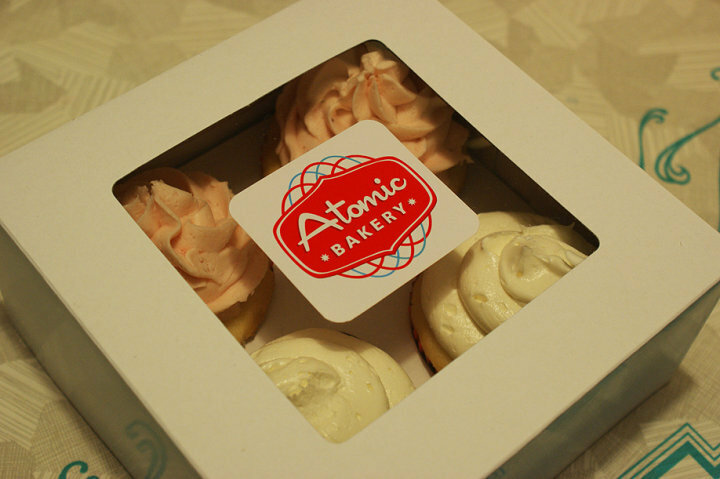 Atomic Bakery has great personality, aesthetic, and of course, CUPCAKES, so check them out whenever you see them! Atomic Bakery LLC. We sell various baked goods such as cupcakes, brownies, blondies, truffles, and granola. Everyone really seems to love our cupcakes. The “Phantom from Space” (Chocolate Raspberry) is one of our most popular flavors. I think it’s well-liked due to the moist cake, rich ganache filling, and fresh raspberry buttercream. It’s just a great combo. We’ve been in business for 2 years. Customers seem to really enjoy the design and aesthetic of our signage, packaging, and web presence. I think people would be surprised to know that we produce all of our own designs. Brandon is a graphic designer by trade, so he is a great resource in developing all of our branding and materials. We really enjoy trading with Tater Dave’s. Their bread has wonderful flavor and makes a great grilled cheese. We also absolutely love Simply Savory’s boursin spread. We make sure to pick some up at every market we sell at. And, of course, no day at SOJ would be complete without a pizza from Pizza Tonight, especially the Fig & Pig! 5. Describe a typical market Saturday for you. Our Saturday typically starts around 5:30am. All of our treats are loaded up into our truck and cooler and we’re off to market – generally arriving around 7am. We have our set-up routine down to a science and are usually ready to roll by 7:30am. From then on it’s lots of smiles and excitement as we share our products with the customers! *Available for pick-up at SOTJ when The Atomic Bakery is vending – baker’s choice. Sharing is optional.